Edgy urbanscapes have become commonplace, replacing bucolic or tranquil vistas captured both in plein-air and from photographs. Among this mass, the architectural paintings straddling fantasy and reality by Gustavo Acosta stand out. Devoid of people, geometric and somewhat abstracted compositions like “Historia Del Rio” offer viewers an option of immersing themselves in the scene. Not inclined to spoil a perfectly good composition with leading details like bodies to denote scale, Acosta negates any comparison to architectural illustration. He prefers to create worlds that belong to him rather than a client. “Historia Del Rio” is dominated by predominantly purple/lavender and turquoise geometric shapes suggesting a parking structure with walkways to nowhere, or a close-up view of architectural details that do not seem to belong anywhere. On second thought they do belong somewhere – within the visual and narrative constructs of magical realism. 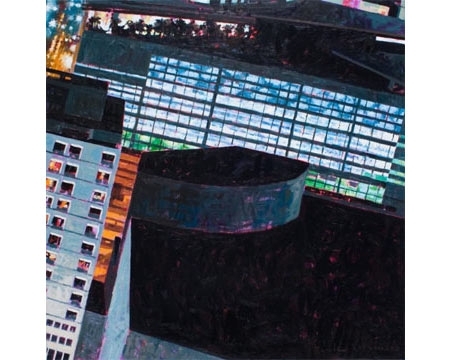 That is to say, when one studies the background, depicting high rise buildings set against a night sky, one either gains a sense of place or loses it altogether. Acosta appears to have a preference for night scenes, which in lesser hands can look contrived. His painterly skill in creating an atmosphere produces a perfectly plausible image that still retains a crucial element of mystery. An empty, lit up building in “La Playa” appears full of life even if one can’t see the activity. A trio of tall palms stands sentry, adding scale and also a sense of the ominous. This particular resonance looms as well in several works where office towers with darkened windows seem to hold secrets that can only be revealed through one’s imagination (“Seeking Shade”). Acosta veers off architecture in “Naturaleza,” a night scene set around a brightly lit swimming pool. Here he purveys an atmosphere that is ghostly enough to make one think of a horror movie waiting to be made. Since Acosta was born in Cuba, one might be forgiven a slight generalization: Like many of his Latin American compatriots, he is not afraid of color. The artist masters it to perfection and yet, when the opposite better serves his purpose, he is able to keep his palette nearly monochromatic without sacrificing impact. The exhibit is aptly titled “Art of Illusion.” We can see what we want to see, as well as what Acosta wants us to perceive — magic.